$8.49 to $31.49 & FREE Shipping on orders over $59 $35. 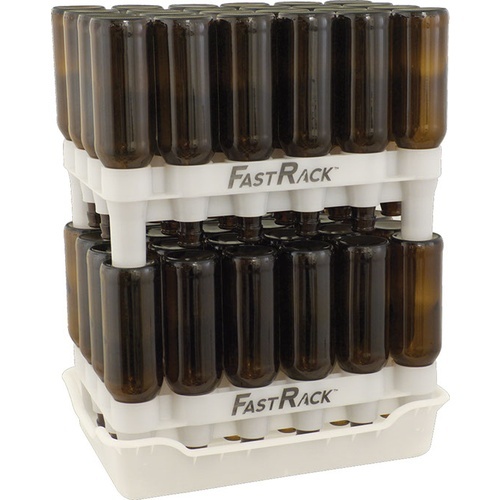 The FastRack bottle drying rack is the easiest way to drain, stack, and store your empties! 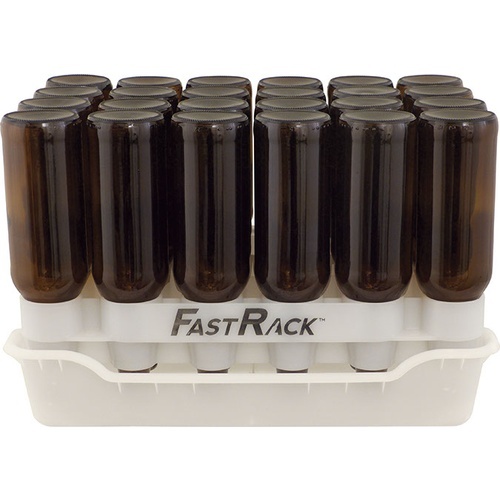 When bottling, use the FastRack to hold your bottles after sanitizing, and have them ready to fill with your delicious homebrew! The FastRack takes up far less space than a bottle tree. This is a very sturdy system, and even when stacked over 4 levels tall, maintains stability! Works for standard bottles as well as swing tops. We sell the Fast Rack components independently, or in a handy combo pack of 1 Tray and 2 Racks. 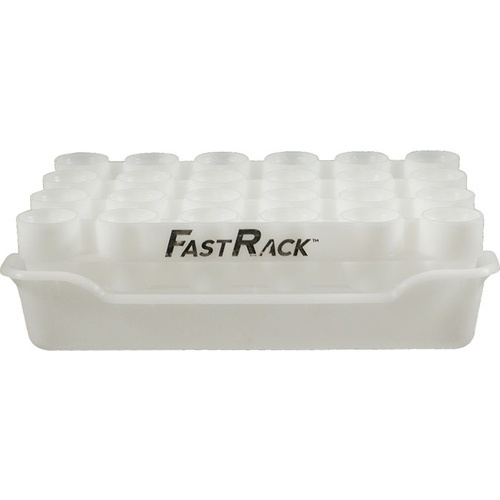 2 FastRack Racks will hold 48 x 12 oz bottles, a full 5 gallon batch! Compatible with 12oz bottles only. My shelf doesn't have space to stack two bottle trays so I will have them next to each other. It seems like a cool concept. Better than anything else I have. I wanted something to make bottling day easier and safer than lining up bottles on the floor. Better than using a dishwasher rack or bottle tree. Great way to store your bottles. Compact. Chickens can't knock it over like the beer tree. Looked sturdy, liked the shape, easy to store. Easier way to store bottles. Bottle tree is huge, this takes up less room. To have a way to store bottles whilst bottling. I use these when cleaning, sanitizing and holding wine bottles before bottling. Commonly sold with 1 base tray with 2 rakes. 2 racks with bottles inserted is unwieldy. Nothing has ever fell, but I prefer 1 rack to 1 base tray. It accomodates all sizes of wine bottles. Better storage than stacking upside down in boxes. A clean look. Well made good design stable and stores my bottles in a compact unit. This is exactly what i needed for my bottle cleaning/storage system. I love it. These are by far better than the bottle trees i had used in the past. They hold more bottles and take up less vertical space. I don't bottle very often so this is a great product for small bottling jobs. It's compact and stores easily. I didn't get the base, just use a baking sheet to collect the Star San after disinfecting the bottles using the economy sanitizer injector. Great way to store cleaned bottles. Fast and easy to use. Clean stack and than fill you bottles.,everyone should have one. Love it! I'd take this over a bottle tree any day. I gave it 4 stars because it is well made but it only works with the 12 oz bottles without the flip tops. The larger bottles wobble and you can only put about 8-10 bottles in it. The holes need to be deeper and wider spaced apart. But it is perfect for small bottles. Used this system to drain and dry 48 12 oz longnecks for a hard cider run. While I usually distill, not brew, I didn't know what to expect. But it worked like a charm. Great rack for drying beers. Also great customer service at More Beer! Just got my Fast Racks and they are incredibly convenient for storing your rinsed bottles between bottling sessions. They stack well and keep all the bottles safe and stable in the store room. I also like them for sanitizing the bottles a day ahead because the opening is facing down and nothing sticks into the neck or rim of the bottle. All my bottles were clean, dry and ready to go the next day. I highly recommend these if you are using a lot of bottles. I have two sets and think are terrific. Very sturdy, surprisingly so and easy to store. Makes my bottling day work so much easier. I do wish bombers fit a bit better (perhaps the wine bottle version for these? ), but this is a great product. If you've ever tried to dry out bottles without a fasttrack you know it can be difficult. With this I am able to speed up cleaning time and have a simple solution for storing bottles until the next batch is ready. I have two racks and the drip tray and will purchase a couple more racks soon. 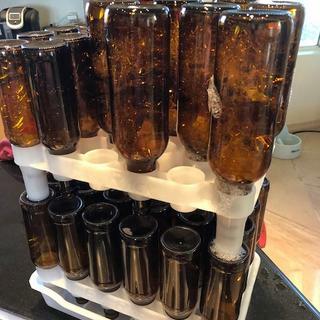 This is the best method for drying newly cleaned bottles and for holding sanitized bottles ready for use on Bottling Day. The bottles drain thoroughly and nothing comes in contact with the insides or mouths of the bottles. This is a great solution! You need this. Better than a tree, dishwasher or dish rack. Simplify your bottling. Won't hold Easy Cap(flip top). Each rack holds 24 twelve ounce or 12 twenty two ounce bottles. I no longer consume space in the kitchen drying two cases of bottles and there's no risk of the wife breaking them now that the bottles sit in a safe, secure and stable rack. This is one of the best new home brewing products I've purchased in a while. The plastic is very heavy, which makes is very sturdy. It's very easy to store, and it makes the process of bottling very orderly and neat. I like that the excess sanitizing water is collected in the bottom tray instead of the kitchen counter. I can easily carry the tray with two racks of bottles (48 bottles) without fear of dropping them. I highly recommend. It's so simple it's a thing of beauty. The construction is very sturdy. These are easier to clean and don't take up space like bottle trees. I will be buying another set soon. Works with bombers and 12 oz bottles. Good for beer bottles but not for 750ml wine bottles. Unable to fill entire rack with 750ml wine bottles...I should of looked closer at the product but since its on the MOREWINE and not MOREBEER website thats my fault. You can only add so many 750ml bottles per rack. You have to use every other bottle hole because of the width of the bottles and then offset the other row for the second set of bottles. The construction of the product itself is made very well. Why are you downgrading the product when you admit that you purchased the wrong item? Why did you downgrade your review when you admit you bought the wrong item? It does what it is made for. Bought the set with 2 trays and the bottom tray. Bottled half a batch and keeged the other half. This thing worked great to dry the bottles after sanitizing them. I just rinsed, put them upside down, and they were dry pretty darn quick. Fits a lot of bottles, and is very sturdy. A LOT better than a tree, and takes up a ton less space when trying to store it. Also, it seems like it would clean up super easy if it somehow got dirty. I love it! !